Available tomorrow, the latest Kindle ebook from Charles Marohn. America is having a one-dimensional discussion on transportation. The central question – how do we get more money to continue with our current approach – fails to adequately explain why our current approach has left us lacking funds in the first place. Political leaders say they want a “world class transportation system” but are not able to explain, in any credible way, how to bring that vision about. 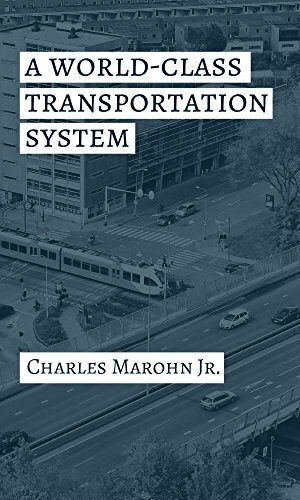 A World Class Transportation System, explains why we are stuck, the consensus principles that can unite Americans and the practical – albeit paradigm-shifting – approach that can be used to build the highways, transit systems and local facilities we need to be economically competitive. I was prompted to write it in early 2014 when the transportation coalition in my home state of Minnesota – an organization called Move MN – released their long-awaited, and very disappointing, transportation funding proposal. The intention of this ebook is not so much to shape policy as much as it is to frame the debate. The discussions we are having in America over transportation funding are not serious. The solutions being put forward by politicians and activist groups do not even rise to the level of a band aid approach, as pathetic as that is. I’m tired of watching Rome burn while the insiders fiddle, seeing bridges fall down and expensive roads go bad while we spend billions on new stuff we will never be able to maintain. Transportation policy in America needs to focus on building cities that are financially productive and then connecting them with high speed, high capacity roadways. We built the interstate. Cross it off the list. We’re done. It’s now time to use that investment – to mature that system – to start getting more out of it. America needs a world class transportation system. We will only have one if we are willing to challenge our current belief systems and make some fundamental changes to our approach. This book is about doing that.